“Booze is a busy, busy muse,” says Rosie Schaap in a Food 52 interview about her book Drinking with Men, a memoir told through the bars she has loved. I can’t wait to get a hold of her book. I run into Schaap all the time (virtually, of course). Searching for an old-fashioned recipe (oh, I know, how uncouth of me not to know) I found this delightful blog post “The Old-Fashioned, in Song and Dance,” and opted to enjoy one as Panama Hattie would have — “Leave out the cherry, Leave out the orange, Leave out the bitters, Just make it a straight rye.“ In a 12 Questions post, I learned that she was once a librarian for a paranormal society. And after reading Schaap’s review of Olivia Laing’s book, The Trip to Echo Springs: On Writers and Drinking, I now have to add that book to the growing pile on my bedside table. But, back to booze as a muse… My booze muse lately has been Cynar, an artichoke-based amaro, or liquor, made by Campari. The artichoke base is muted, in my opinion. You might think it’s going to be quite odd, vegetable-like, but you’ll find that it has a almost-but-not-quite-cloying herbal sweetness at the beginning that pleasantly rounds out to a bitterness at the end, a bitterness lent to the amaro by a chemical found in artichokes. I first tried it in a bar in Florence, Italy, last month — the bartender generously let me have a sample taste, telling me that I probably wouldn’t like it. I liked it. I came back to the US and found I missed the boat. It’s already become rather popular here. Search the internet and you’ll be awash in Cynar-spiked cocktail recipes. Some of my favorite local establishments have it on their menus — All Souls Bar in the Shaw neighborhood of DC has an excellent Negroni made with it, and Red Hen restaurant in Bloomingdale in DC serves it as an after-dinner digestif. Still, it’s hard to actually get a bottle of it for your home. After trying all the likely liquor stores that I would have thought would stocked it, I found it in the Watergate Wine and Liquor shop, a surprisingly well-stocked shop that doesn’t even have a webpage. After trying it with a variety of liquors and mixers, I found that it is excellent with ice and a twist, and also with rum and fruit juices. Recently I had a lot of blood oranges on hand — their similar bitter-sweet taste complements Cynar, and I came up with this cocktail, There Will be Blood Orange. I guess I should apologize for the name, but I won’t. Fill a cocktail shaker with all ingredients and ice. 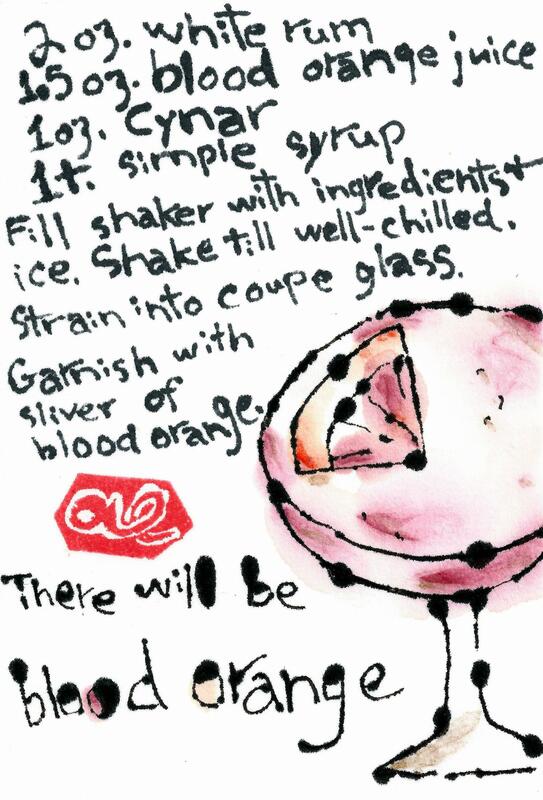 Garnish with a sliver of blood orange, or at least with a twist!